At Camping Village Doñarrayan-Park in Hinojos (Huelva) camping costs as little as €18,- per night during low season with CampingCard ACSI. At one of the 48 touring pitches you will get a discounted rate during the period 01-01-2019 - 11-04-2019, 28-04-2019 - 28-06-2019 and 02-09-2019 - 02-11-2019. At this campsite you can not only use your CampingCard ACSI for inexpensive camping, you can also use your ACSI Club ID (as an alternative ID). 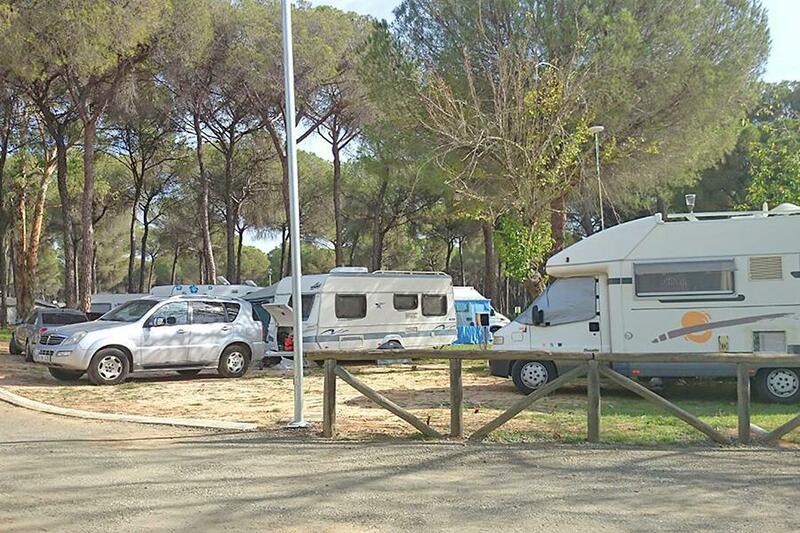 Beautiful campsite located in the woods in the heart of the Doñana National Park. Ideal for people seeking some peace and quiet, nature lovers, walkers and families with young children. Excellent amenities, swimming pool with lawn, restaurant and a small shop. On the plus side the pitches are a good size and the hot water is very hot but that’s it. Restaurant ,bar and shop only open at weekends. Showers and toilets are limited to one block for the whole site and they are not big blocks, 4 or maybe 5 showers each for male and female, luckily the place is like a ghost town so no problem. The site is no longer part of the “Yellow Village “ group. Beautiful location, excellent EHU, clean and modern facilities, quiet. Ideal for walkers but also good for an overnight stop en route to Portugal. We really loved this campsite set in the middle of a pine forest. The pitches were very spacious and the setting magical. Gorgeous swimming pool. We really recommend the half day trip into the Donana National Park starting from El Acebuche visitors centre. The staff at the campsite will make a booking. We like our campsites to have a wilderness feel and this exceeded our expectations. The site is very well maintained. We would go back. Es gibt permanent sonnenbeschiene, heiße Plätze (hierfür gilt Nebensaisontarif), und solche, die tagsüber (wenn auch nur zeitweise) Schatten haben. Alle Plätze sind sehr groß, mit sandigem Boden. Aus den Wasserhähnen von Duschen und Spülen kommt richtig heißes Wasser. Nur – insgesamt herrscht an Sanitäranlagen ein geradezu dramatischer Mangel. Im Prinzip sind sie durchaus sauber, aber 3 Geschirrspülbecken sehen bei voller Belegung des Platzes im Nu wie ein Schlachtfeld aus. Das gleiche Bild bei den Toiletten und den (recht kleinen) Duschen. ei Vermeidung des Restaurantsbesuchs vermeidet man auch weiteren Verdruss: Es dauert alles ziemlich lange, das Angebot ist eher begrenzt und die Qualität ist reichlich mäßig. Bit reserved after reading some of the reviews but lovely location in Forest. Yes there are flies and ants but you are in the woods camping! Swimming pools are great with sun loungers, pitch was spacious Sandy but private. WiFi you get 30 mins free every 6 hours. If WiFi so important to some folks then suggest they stay home! If you like quiet and nature this is for you. Friendly, peaceful, well-kept site with helpful staff at reception. Good, clean facilities including pool. Large pitches separated by hedges and trees. Paths for walks/cycling. Did not try restaurant, but fresh bread at shop. A good base for exploring the area or relaxing on site. Would return. It's in a lovely setting amid the umbrella pine woods with plenty of shade. The pools are pretty too. It is very expensive just now in early July at full rate, although the staff are only here from 10am until 8pm. The WiFi is unreasonably expensive; you can have a half-hour free - not per day but per visit per group so whether you stay one night or a month you get half an hour. REALLY unfriendly tariff. We use WiFi for the travel blog we are writing and for information about the area we are in plus identifying and booking the next site. All that is infeasible here so make sure you load yourselves down with printed guide books. The staff here say that the WiFi is nothing to do with them and absolutely refuse to discuss it.The owners should perhaps try learning about life in the 21st century and about customer service. If you have any use for WiFi you should NOT stay at this site. Oh and of course as this is in a forest there is the constant of flies, midges and mosquitos, many of which bite. As said, this site is in the heart of the Donarrayan Park and in a beautiful location. There is a concrete cycle track into the village. The site has just joined the Yelloh group and I would expect there to be major improvements over the next few years. There had just been a lot of rain and many of the pitches were drying out. Watch out for the big kerbs if you have a heavy van as we had difficulty getting off. Showers were being improved with a screen to provide a dry area to store clothing and this is te bare minimum that is needed. We really enjoyed our stay here and it was during the festival at El Rocio (amazing) Lots of new quality units had just been placed on site which should generate income to allow further improvements. This site has loads of promise for the future. Why are there no reviews in ACSI for this site?! It's in a beautiful area. Expensive for what you get (unfortunately we arrived during a festive time and ACSI rates did not start until 17 May). Wish we had known of the festival as we would have stayed longer at AlHama de Murcia - which was fab - before continuing. Wifi here is expensive. You only get 1/2 hour free in bar. Only 1 washing machine, not available till 10am. A disappointment for such a beautiful area. Would you like to book Camping Village Doñarrayan-Park or request more information? You can do both using the information below. Follow E1/A49 Sevilla-Huelva. Take exit 34 Chucena/Hinojos. Via A481 to Hinojos. Take ring road A474 direction Almonte. After ± 500 metres left to Almoradux and ± 5 km to campsite. CampingCard ACSI will send your information request to "Camping Village Doñarrayan-Park".